To increase the wood supply to its industry, the government of Québec has allocated dead and sound wood (recently dead merchantable stems, DSW) to the wood supply chain in addition to the annual allowable cut of living trees. However, DSW is often criticized by sawmillers for its perceived poor quality and lower value. 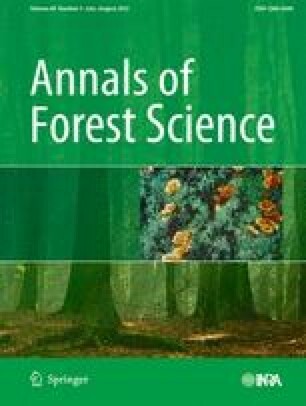 The objective of this study was to compare the lumber visual grade yield and value from live and recently dead merchantable trees in three different states of wood decomposition. In total, 162 black spruce trees [Picea mariana (Mill.) BSP] were felled from three different sites comprising three different states of wood decomposition and three diameter classes. The state of decomposition of each standing tree was categorized following Hunter’s classification (decay stages 1 & 2, 3 and 4) and the DSW classification developed by the Government of Québec. Large trees (> 20 cm) of the Hunter 4 class have a lower value as a result of inferior quality. Considering the current economic difficulties facing the forest industry and the requirements of ecosystem-based management, we recommend leaving in the forest trees that have reached such a state of deterioration. Julie Barrette was the first author on the manuscript, and carried out the main data analyses. She was principal investigator in the both the design and the implementation of the experiment. David Pothier was the second author and contributed substantially to the manuscript. He was involved in the experimental design and data analysis, and was the main supervisor for the project. David Auty helped to revise the manuscript, and contributed to the interpretation and presentation of the statistical results. Alexis Achim helped to revise the manuscript, and contributed to the interpretation of the statistical results. Isabelle Duchesne helped revising the manuscript. She was also involved in the design of the experiment and in the supervision of this project. Nancy Gélinas made valuable comments on the manuscript, and was involved with the design of the experiment. We are grateful to people involved in the field work: Eugénie Arsenault, Jean-Philippe Gagnon, Julie Gravel-Grenier and, Frauke Lenz. We would also like to thank Luc Bédard, Francis Tanguay, Ghislain Veilleux (FPInnovations), and Emmanuel Duchateau and Filip Havreljuk (Laval University) for their help during the sawmill trial. Our gratitude also goes to the Boisaco forest and sawmill staff for their valued collaboration in this project. Financial support for this project came from FQRNT and the NSERC–Université Laval industrial research chair in silviculture and wildlife. R Development Core Team, 2011. R: A language and environment for statistical computing. In: Computing R. F. f. S. (Ed. ), Vienna, Austria. ISBN 3-900051-07-0, URL http://www.R-project.org/.